This weekend I am fortunate enough to be teaching for the EGA Tennessee Valley Region Share-A-Stitch seminar in Huntsville, Alabama! My first time teaching in Huntsville - been all around it but never settled in here. We are right next door to the AL number one tourist attraction - the NASA - US Space & Rocket Center. How cool! My room here at the Marriott is very lovely. But I had to chuckle internally as my busboy was so proud as he told me I had his favorite room because of the view and he 'threw open' (really very dramatically) the drapery and said you see the mountains - that's where I'm from. I made flattering comments but did not have the heart to tell him I was raised in the mountains of West Virginia so I am quite accustomed to mountain scenes. I am teaching my Pumpkin Spiced Tea piece. 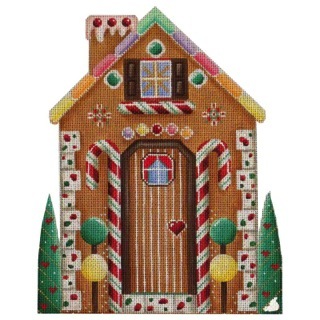 We are playing with needle felting, stump work and many traditional needlepoint stitches as well. I have some repeat students and some that I can now place faces with names. It is a lovely group and always fun to share my take on things with those wanting to learn. I was asked to post a direct link to my Shapes of Needlepoint Series I and Series II Apps. Here goes - hope this works! I can understand because I can never find apps online like your supposed to - I think iTunes and Apple Apps dislike me - but I eventually get there. I don't you to get frustrated trying to find mine so here you are. Thank you Miss Webmaster! 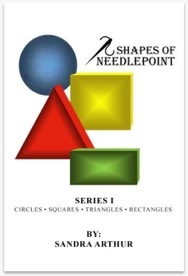 All four of the Shapes of Needlepoint Series 1, Series II, Series III and Series IV can be ordered through your local needlepoint shop. If they do not carry them they are also available on my website duodesignsinc.com. 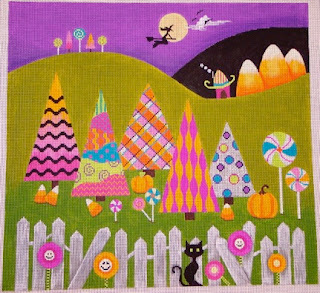 Only two weeks away from our first lesson for Happy Haunting Grounds by Eye Candy. Still time to register so just email me at duodesignsinc@yahoo.com. 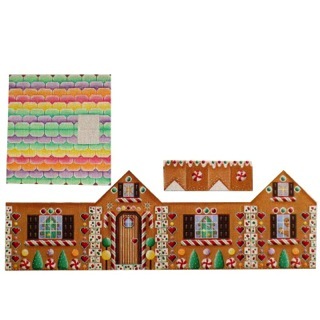 Be sure to scroll down a little more and see our latest 'by demand' Online Mystery Class - Gingerbread House from Rebecca Wood. 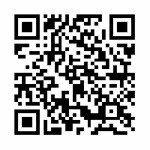 Although the class cannot be until mid-2018 the sign ups for the notification list are quite active. Send me an email at duodesignsinc@yahoo.com if you want to be included. As we get closer to the time we will provide more information. Of course, it is never too earl to get your canvas ordered. Look on down a little further and you might find another class or two that you are interested in. We would love to have you join us. Okay, gotta get back to playing - uh - I mean work! Have a great weekend and coming week! Yep! They slipped another one in on me! My students have got my number - as we say! They have learned that if they ask very nicely (plus beg and plead a little) that I will do just about anything that I am capable of doing (as Daddy always said 'as long as it is not immoral or illegal'). So here we go again. One of my students goes out there on "The Nation" and makes a plea for others to join her in having me do an online class for Rebecca Wood's Gingerbread House. Now, in all fairness to her, she did ask me first and if my guidelines of having 5 or more would convince me to do a class. So she is off the hook - sorta! We'll see. Now, bare in mind that we will not be doing this class until mid-May 2018. That means you have plenty of time to save up and get those canvases ordered! I'll tell you a little secret, too. I am excited! We have not done a house in this venue as yet and I know we are going to have a great time. Oh dear, I sit and look at this pic as I am typing and I'm thinking 'oh this will be great here! oh, what about this for that'. See, you guys drive me crazy! Anyway, just throwing the new little teaser out there for those of you who like to plan ahead. The notification list has already grown quite a bit for a one-day activity! If you would like to join us just send me your email address to duodesignsinc@yahoo.com and tell me to add you to the notification list. 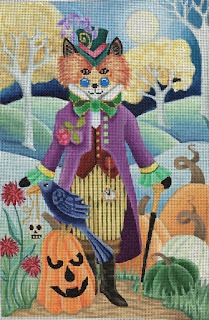 So, for now, get back to stitching and remember to do so with a smile! You all make me smile with your wonderful support and participation. It is hard to believe we have had to say goodbye to another ONLINE MYSTERY CLASS! 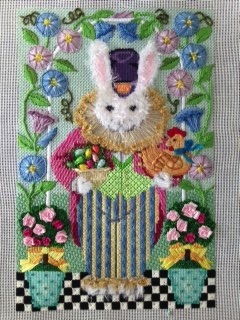 Yes, sadly we posted the final lesson of the Easter Rabbit with Morning Glories by Brenda Stofft Designs. Isn't he devine? And, several participants have been sharing pictures of their finish! They all make me so proud! 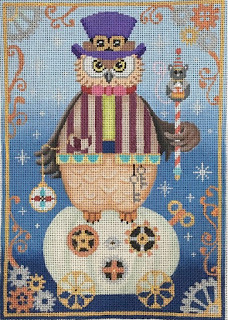 Oh, and my fantastic webmaster surprised me and posted the commercial stitch guide for this fellow (meaning contains less pictures and narratives than the online classes do). 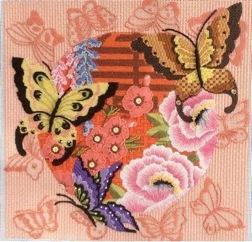 So if you are interested you can get it at our website at duodesignsinc.com under Online Shop - Stitch Guides. 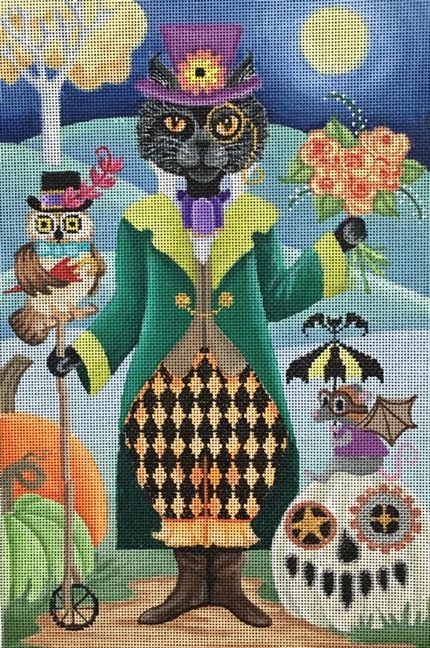 You are meeting Steampunk Fox, Steampunk Cat and Steampunk Owl. Oh my goodness are we going to get into a lot of trouble with these guys. No details have been set up yet so just keep your eyes on this blogspot and we'll keep you informed. In the meanwhile, it is never too early to get your name on the notification list - email me at duodesignsinc@yahoo.com - nor is it ever too early to get your canvas order in. Shops are currently taking orders. Contact your local needlepoint shop right away and get that in the works. Materials lists are generally posted one month prior to the posting of the first lesson. In the meanwhile, we continue on with our regular routine. 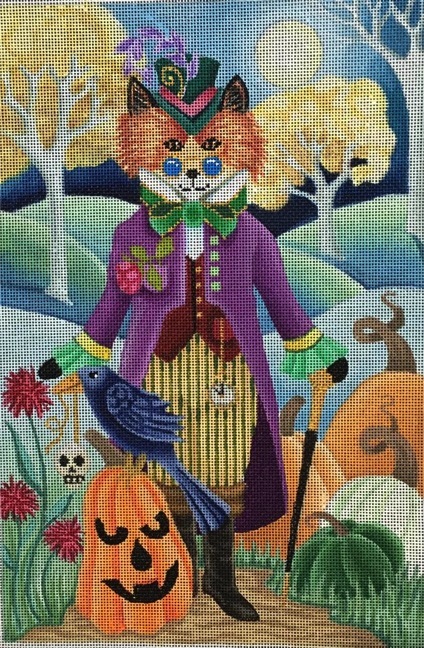 We have shared Lesson 4 in the fantastic Online Mystery Class Thanksgiving Critters from Melissa Shirley. 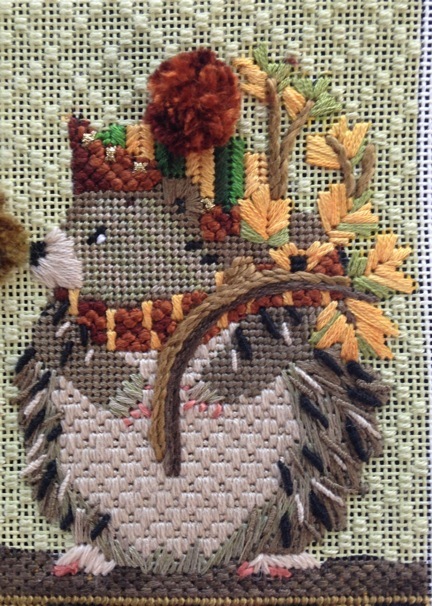 This month Mr. Hedgehog made his debut! He is all decked out in his fall finery and ready to join his companions. Who will be next? There are only two that remain - will it be the skunk or the squirrel? Stay tuned to find out. We will soon be posting Lesson 1 of the Online Mystery Class Happy Haunting Grounds. Less than a month away! Oh boy! Oh boy! There is still time to join in on this one. Just email me at duodesignsinc@yahoo.com so we can get you enrolled to participate. And, of course, the wonderful Online Mystery Class Arctic Parade by Brenda Stofft has had Session 1 posted. 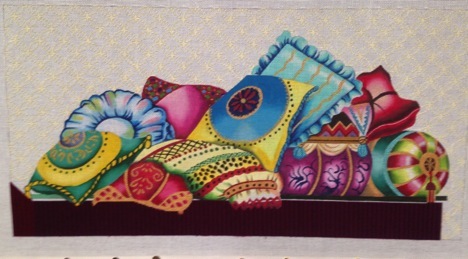 I am happily stitching away trying to be ready for those who are still awaiting their monstrous canvases. Once they all get their canvases, get them mounted and the background threads arrive, they will have plenty to keep them busy. In the meanwhile I am just jumping here and jumping there playing with ideas, stitches and threads. 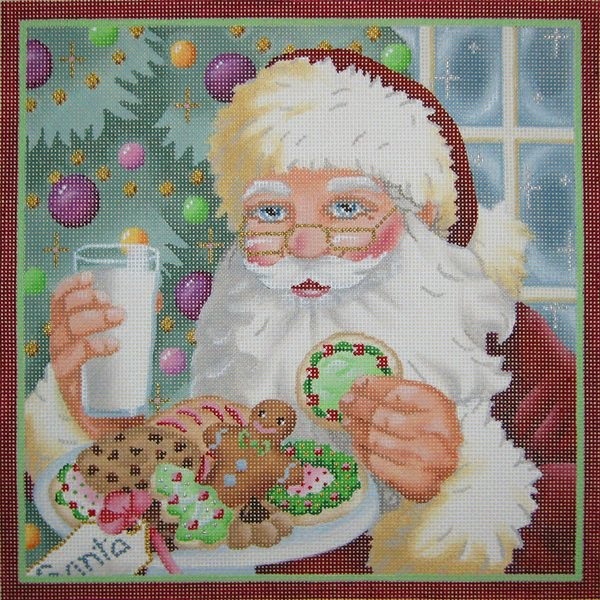 This class does not have a strict lesson schedule so who knows when Session 2 will be going on its merry way? Oh, and we won't even discuss that I leave this coming week to teach in Huntsville at the EGA Tennessee Valley Region seminar. Then shortly after returning from there finish up the kits for the ANG national seminar in New Orleans - - - well, like Scarlett, tomorrow's another day! So, as you can see there is lots on my plate and I'm loving it! There is still time to register for lots of classes so just drop us an email at duodesignsinc@yahoo.com with any questions you may have concerning what we are doing at this end. Have a great week and remember to Stitch with a smile! Just a little over a month until we launch into our next new Online Mystery Class - Happy Haunting Grounds! First lesson to be posted mid-July! Can't wait! Seems we just started the sign up process a few short weeks ago and here we are almost ready. Invoices have been sent - and most already paid - first lesson is prepared - materials list posted - and participants are joining the Secret Facebook Page - and people are getting antsy! This happy piece will be a great trip through threads of all sorts and techniques and stitches as well as a few sew-on embellishments maybe. There is still time to join us if you wish. Just sent me an email to duodesignsinc@yahoo.com. We have our fourth - yes! 4th - lesson posting for the Thanksgiving Critters! Wonder who we are going to play with this month? Two down and three to go! Such mischief! Each has his/her own personality! Be sure to check back next week for some sneak peeks to see what we did! Accompanying this excitement is a little sadness too! We say goodbye to Easter Rabbit with Morning Glories. Didn't he turn out fabulously? He is at the TNNA Market in DC right now strutting his stuff! If you are there go over and see him in person at Brenda' booth. He will have a stitch guide. And look who is waiting in the wings to get his first stitches added! We are currently taking enrollment for this great guy. Who doesn't like robins? Wow! 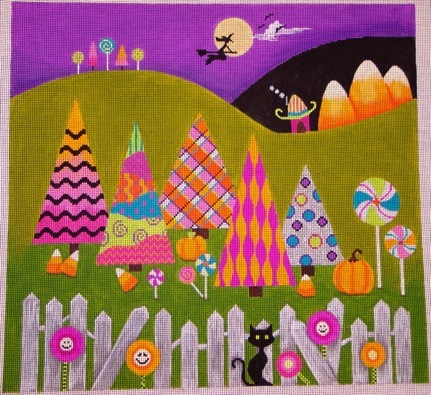 There is so much here that can be used on so many other canvases! And there are several wreaths in this series. A bird! A nest! Fruit! A wide variety of leaves! Oh my - oh my! To sign up send email to duodesignsinc@yahoo.com First lesson will be posted September 15. Registration through August! And right behind Mr. Robin is our last class for 2016 - Santa's Rewards. Active registration is ongoing for him as well. First class in mid-November. Don't miss this one! And, of course, my life is consumed daily with the fantastic adventure of Arctic Parade. This week I finished the background for side one and so I had the pleasure of starting to introduce some color. Soon I will be sharing another technique for the masses! I have a routine started where each morning when I awaken, I fix my cup of coffee, quickly check emails to make sure no student is stumped, and pull up a chair and visit with this big guy. I am an early riser so I do this every day until my husband awakens. That's is when I stop and go have breakfast with him and then my 'real' day begins. 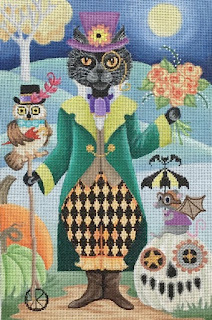 I change spots and stitch on another Online Mystery Class, stitch guide preparation, models, or whatever is on the 'must-do' list. Okay so I'm off this morning. 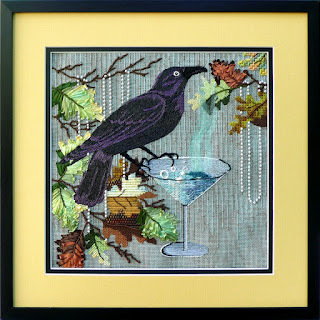 Have a great weekend, enjoy the TNNA show offerings and remember to stitch with a smile! STITCHING IS MY HAPPY PLACE! I have the good fortune at this stage in my live to stitch to my heart’s content. But my greatest joy is from teaching and sharing this wonderful art with anyone who will listen! I accomplish this feat through many venues: Seminars, retreats, shop classes, chapter classes, online mystery classes and stitch guides – just to name a few. People often ask me how I decide what stitch and/or what thread I use when writing a class or stitch guide. If you know anything about me you know that I love to embellish. 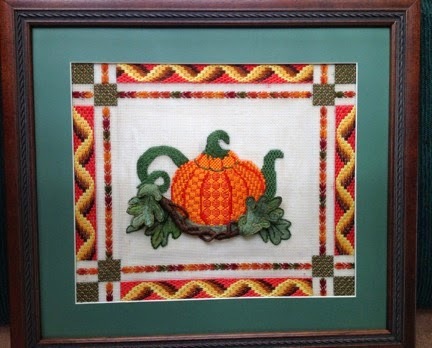 Dimensional and textured stitches and techniques are a great way to begin the introduction of stepping beyond flat surface stitches and basketweave. How do you accomplish adding texture and dimension to needlework surfaces they might ask? You must first decide what you want the end result to be. Do you want elegance or whimsically fu-fu for instance? 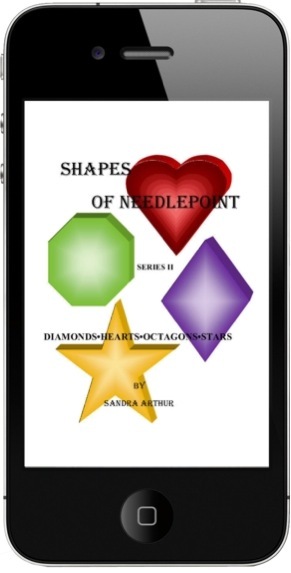 Of course, stitches play a major part in reaching your goal. 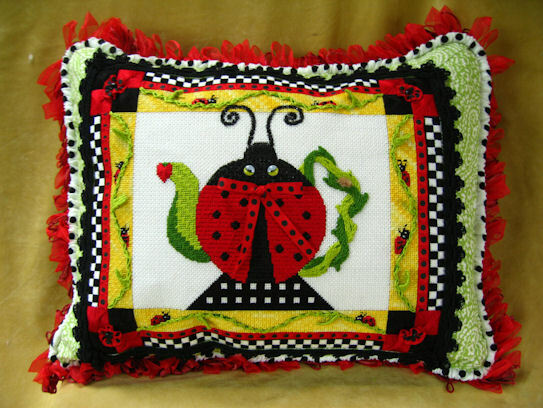 I find, however, that threads are a great resource for changing a simple stitch technique into something unforgettable on the design. I love introducing my students to threads that they may not be familiar with or have never used. Often there is a hesitancy to try a new thread from the uncertainty of knowing how to use them. I also am mindful that not all stitchers have many readily available resources from which to choose. Not all shops can carry all threads, etc. I am currently working on several Online Mystery Classes. One of the attractions to these classes is the introduction of new or unfamiliar threads to the students. Not only do we introduce them to new products, we also can provide them with suggested resources for obtaining those products if they do not have a local needlepoint shop or their shop chooses not to carry a certain line. My first go-to website for thread shopping is always Rainbow Gallery! Why you ask? Think about it. How many manufacturer/distributor sites can you visit and cover such a wide gamut of textures and finishes? I like to include fuzzy, smooth, shiny, matte, metallic, dull, overdye, thick, thin, etc. For me my mind immediately goes to Rainbow Gallery as a source that will have the widest variety of thread finishes from which to choose. What a wonderful convenience for the shops to be able to combine such a great variety of threads in one order. 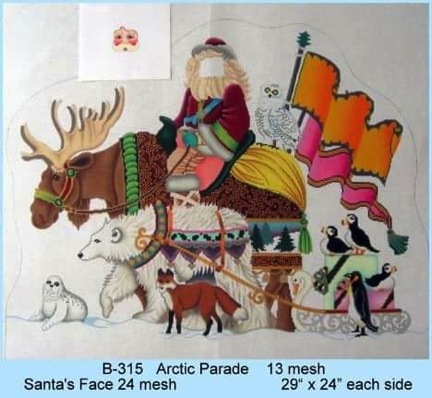 On one of my current Online Mystery Classes – Arctic Parade by Brenda Stofft – it is a fantastic adventure into all kinds of techniques. We have only begun our two-year journey and I have selected threads such as the ole standby Splendor Silk and Mandarin Floss or the new Capri for some of the basics. But wait! There are tons of animals in this piece! How about Fuzzy Stuff or Fancy Fur for those animals that have long fur – bears, fox, toys, or Artic Rays for some fuzz with bling for maybe some birds and other accessories? Smooth bodies? 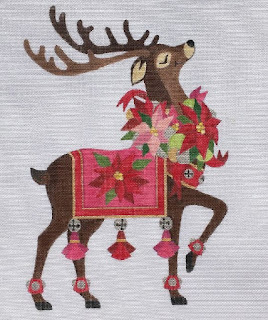 How about the different sizes of Very Velvet, Super Suede or Ultra-Suede – moose antlers, sweet little seals? See anything shiny here – like maybe flags? Snow on the ground? This is going to be an incredible journey for me and my class participants! Isn’t Fancy Fur the perfect ‘fur’ for this guy? And look at the Frosty Rays collar – it worked out so well. The new Capri gave us just the finish we wanted for the trellis holding the flowers. Shine – do we need shine? There is lots of gold and glimmer in this piece. If we want a ribbon type thread there are tons of options from Rainbow Gallery such as Neon Rays, Neon Rays+ and Sparkle Rays or Sparkle Braid. Fyre Werks and Water ‘N Ice can work in the ribbon category as well. Then there are the rayons such as Patina and Panache. How about the new combination threads that have polyester, silk, etc. combined with a metallic that will give a somewhat subtle glimmer – Entice, Silk Lamè Braid – several weights. Speaking of metallic, there is a wide range of threads available that fill this spot – Fyre Werks, lots of different braids – Sparkle Braid, Treasure Braid and Treasure Ribbon to name a few. This great design also by Leigh – Beijing Butterflies – uses Neon Rays+ in the purple butterfly wings, Silk Lamè Braid in the brown butterfly and the subtle background butterflies, and, of course, the wonderful Splendor to create the lovely thread-painted flowers in the front. Other great go-to threads are Flair and Water ‘N Ice – they fill a need that is hard to conquer. They give you the shimmer and see-through effect you need for glass, water, ice, etc. 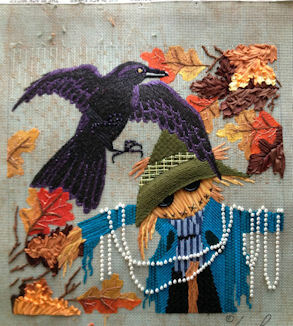 Here is a Leigh Designs piece from her Old Crow Series – Fast Friends – where we stretched Flair over the leaves. And look at the potion vapor from Night Cap as well as the martini glass of Water ‘N Ice. 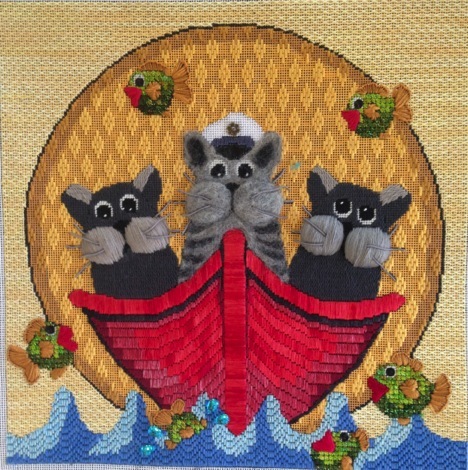 A recent Online Mystery Class from Annie Lane – Cat’s in a Dinghy – used Flair on the fishy tails. Also notice the patent leather in the Captain’s hat – just to name a couple of other items. And of course there is sparkle in the water! If you haven’t gotten the impression from me that this one-stop website is very valuable to me in that it saves me an immense amount of time for having the convenience of doing my major thread selecting in one place then you are missing something. 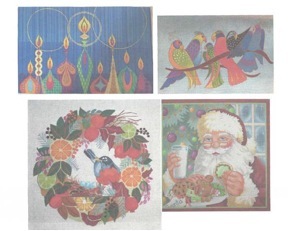 I know of very few designs that I have worked on that do not contain something from Rainbow Gallery. 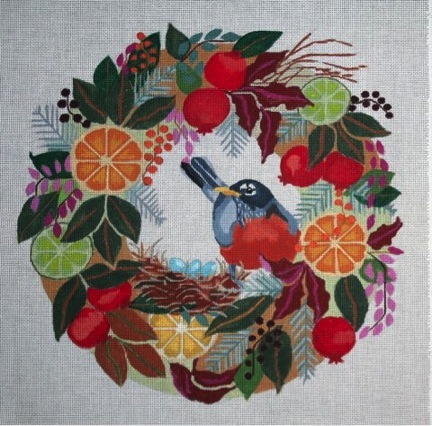 Having read this and looked at some past projects, think of what we are looking at in our future Online Mystery Classes: Robin’s Wreath, from Melissa Prince, Santa’s Reward from BB Needlepoint, Songbirds from Danji a Laurel Burch design, the Menorah from Tapestry Fair. And that’s just highlighting a few. The remainder of 2016 and all of 2017 is all lined up for you. And we are working hard on 2018! You think I might find some uses for the line of threads manufactured by Rainbow Gallery in some of these? We have come so far in adding to our thread selections and competition is getting heavier and heavier. Perhaps the best thing about this wonderful thread line is what is behind it! I have had the good fortune of working with some wonderful people at Rainbow Gallery over the years. They have always been very patient with me and help me find threads that I may not be aware are even there. Their quality of service and customer care is unsurpassed! The turnaround time is unmatched! I hope to continue this great pairing with their fantastic color, texture and fiber choices for many years to come! So, run over to the website of Rainbow Gallery - www.rainbowgallery.com - and scan over their wonderful offerings and ask your local needlepoint shop if they might consider adding yet another line of their wonderful products to those they probably already carry. 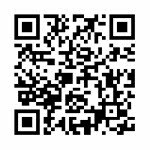 When you get through there, scroll down through past postings and review more detailed information about our upcoming Online Mystery Classes.